Leave it to a Marine to figure out how to make collars perfectly crisp. Brandon Dierker invented Collar Perfect to keep his uniform regulation-ready. But his innovative design makes this compact travel iron great for all kinds of wrinkle removing. Two facing heated plates clamp on either side of the fabric, heating both sides of collars at once. This double-sided action smooths out hems and pockets, too. And the angled edges fit perfectly between shirt buttons. To make Collar Perfect even more versatile, the plates fold out flat—transforming into a mini iron. Tackle bigger areas on almost any type of clothing or fabric. This new take on the iron is great for travel, but it works just as well at home and takes up little space. Whether you like ironing or avoid it at all costs, Collar Perfect is a better way to stay looking sharp, from collar to hem. Hello everyone! I'm proud to introduce Collar Perfect to The Grommet. I'd be happy to answer any questions you have! What do you see as the advantages of Collar Perfect over other traveling irons? The greatest part about Collar Perfect is that it is not just great for travel. It is really handy to have around the home. It is convenient and saves time and frustration. Traditional irons that we’ve all grown up with haven’t changed much and aren’t really easy to use. Traditional ironing is more of an art form, which is dying off. They just don’t work very well for touch ups and hard to reach places. Existing travel irons are basically just smaller versions of the traditional iron. They are usually smaller size, but don’t have the heat ranges that the fabrics require. 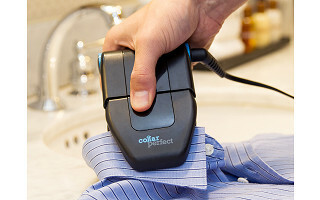 Collar Perfect is specifically designed for what most people need most, quick touchups. Collar Perfect allows the users to pinch and swipe along the fabric to allow heating on both sides of the fabric. You don’t have to iron one side, then flip over to the other side any more. This saves you time and effort. The design lets you make quick touchups without an ironing board while you’re folding clothes, unpacking a suit case, or hanging clothes on a hanger. Additionally, the wings can transform to allow for traditionally ironing if you need it. The design comes with multiple heat ranges, 110v or 220v power support, and is about the size of a cell phone. With all of that, it’s the Perfect solution to have at your home, office desk, or suit case. @Brandon I have a device like this and use it all the time. I think the fact that this one can fold flat and act as a regular iron probably makes the price difference worth it ... but then I'd need an ironing board. My one suggestion, based on experience, would be a safe way to hang it up so it can stay plugged in and not left on a surface somewhere while it is cooling or heating up. Thanks for the suggestion, Chris. Folded up, it can safely be placed down as the plastic exterior won't be too hot. LOVE THIS IDEA!!! Even if you think you know how to iron, those parts are a pain in the tush with a full sized iron. This is a great addition to regular ironing to make it quicker, as well as for travel or touch ups. @Joan You are spot on about the hard to iron areas with traditional irons. Thanks for the comments. Is the Collar Perfect heavy? How much does it weigh? This is definitely a new approach to ironing. @Kathleen The Collar Perfect, to include its power cord, weigh less than 1 pound. First off, let me thank you for your service Sir! And.... I love, love, love this idea. I'm an independent travel agent after my daily 9 to 5, and this will come in so handy. Cruise ships do not want you to bring travel irons for use in your state room, so this should bridge that gap. Thank you. @Debra Thanks for the comment and the idea for use on Cruise ships. Happy Sailing. Great idea, Brandon. We're in groups of frequent RVers, and for those times we travel to other cities and go to more formal events, your product would be ideal as storage is limited in RVs. Have you considered adding a 12 volt version, or 12v. adaptor? @M J Thanks for the comments. We have reviewed 12V adapters and the main problem is from a functional standpoint, 12V don't allow for the right temperatures needed for ironing fabrics. This idea is phenomenal. I served in the British Army and the details are everything when it comes to ironing. One thing I notice though (and I have a little experience with this stuff) is the name. It implies that it's just for collars. If you want people to take a deeper look after that first pass, the name needs to encourage that. You have about 3 seconds to grab someone. The name is part of it. Also, don't forget that not everyone was in the armed forces and, consequently, don't have that same obsession that we share! Also not forgetting that 51% of the world's population generally doesn't wear stiff collars (that's women by the way!). I see this as a fantastic way to I need to do, and my comments are made purely to try and offer an opinion of someone who's marketed a few things well. I'm no longer in the industry and rarely comment like this but your product caught my attention as we've both served. Be aware that most marketers won't share our background. Good luck with this - I think it's awesome! @owen Thank you for your service and for your comments. Thanks for the feedback Owen and, more importantly, your service. The use cases truly extend beyond just collars which is why we highlighted them in the story and video. I will also say that a handful of women in the office were interested in its primary use of straightening collars. @Barb Thanks for the comment. The most important part of wrinkle management is the temperature selection. If the heating device is too hot, you can damage the fabric--even if you don't visible see it. Collar Perfect has adjustable temperature settings to ensure you have the ideal temperature for your fabric. I just pinned this several times: as a gift I'd love!, as a gift for guys!, handy in the laundry room!, great for travel or at a cabin, etc.! ... etc., etc.,.... I'm excited to get one and make sure these are as wonderful to give as it seems they would be to use! Awesome American innovation, Brandon. And better, such innovation is from an awesome American marine! Thanks for being such an encouragement to us all! @Lorraine Thanks for the comment Lorraine. Having one handy in the laundry room makes life much simpler. One quick swipe and you are good to go. Does this have an auto-shut off? This would be a great gift for college students, but most dorms require a shut off feature. @Cynthia Yes. The unit does have an auto-shut off timer of 10 minutes. As a full time marketing guy with many early years in the garment industry I think you are missing a strong selling point in not mentioning pleats for ladies and trouser creases for men. Collar might be good after morning touch-up but trousers, after a day of work are likely to need attention before going out for drinks or dinner. @rosebush Thanks for the comment. Hi Rosebush, those uses are what we focused on in the story and video because while the name is specific to collars, the widespread functionality is the true innovation. Agree this is a great item, especially for travel. You might consider the name "More Than Collar Perfect" for next time you produce the Collar Perfect. I can think of many, many uses! @Joan Thanks for the comment. When using this product do you feel the heat on your hands while using it, do you have to apply a certain amount of pressure when using . @Raabia Please let me know I would like to purchase one for my sewing room if you think it would work good there. Hi Raabia, no, you should not feel the heat on your hands where you would hold it and very minimal pressure needs to be applied when using it. @Michele I've been using my flat iron for this too, but I'm guessing most guys don't have one and thus never thought of this use. I think this idea is genius for all kinds of folks! We wholeheartedly agree. Thanks for the kind feedback! Does the Collar Perfect have a water component for steaming? If not, how does it compare to devices that do? Do you have a "satisfaction guarantee" for your product? I noticed your product is no longer with Amazon. Reason? @Diana Collar Perfect does not have a water component for steam due to its compact size and design. It's almost the size of a cell phone. 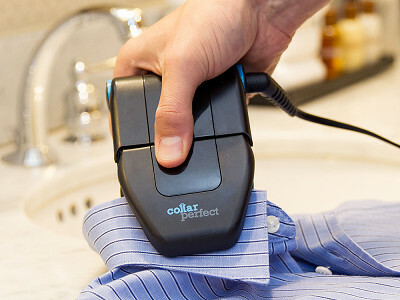 Collar Perfect allows for quick touch ups without all the hassle and difficulty of traditional ironing. As for Amazon, we were on a pre-sales launch that completely sold out. @Brandon The one I bought (another brand) came with a little spray bottle, kind of a kit. Very handy and small. Brandon, this is a cool product, but you NEVER iron a collar with it folded. Ironing in the crease caused the collar to fray very quickly. Fold out the collar to iron it or plan to buy shirts much more often. Hi Linda, I think it was designed more for quick touchups rather than full blown ironing efforts. If you are taking the time to iron, absolutely fold it out. @Stephanie Thanks for the comments. You'll definitely find it more user friendly in the design that will allow you better control to reach the hard to get to places, selectable heat to the matching fabric, and more. Looks like a great product. Do you think you will upgrade it to including some kind of straps for your thumb and fingers - maybe something like hand massagers use, or some kind of elastic bands? The older I get, the more I seem to drop things, so it would be nice to have some way to secure it to my hand during use. @MELINDA Thanks for the suggestion. We'll review with the design team and work with The Grommet's awesome team. As soon as such a product is available on The Grommet, we will be sure to let you know, Melinda! @Judy Thanks for sharing. It'll make one less wrinkle for him to worry about in the courtroom. Thanks for making a product with world-wide voltage! We're getting ready to leave to be in South America for three months and this will be great! @Meagan Awesome and have a great trip. We'd love to see come pictures sent to us of how you used Collar Perfect on your trip. @Roberta Our power rating while heating is 140w. @Brandon That's incredible!! Most irons are all over 1000 watts. This seems like it would be perfect for folks on solar!! Thanks for the reply and I will share the good news with my seamstress neighbors! Brandon, as an AF vet, I once served a year in northern England. I had to purchase an expensive, heavey, "power converter" battery to be able to use our small appliances from the states. Or, we could go to the BX/PX, and buy dual voltage (120 0ver to 240) products, so when I returned home, I would be able to continue using them. Does your iron have multi voltage. @Dotty First off, thanks for your service. Collar Perfect is built for travel in mind. It supports 120 and 240 voltage and doesn't require the big expensive power converters. It's the Perfect solution for travel to any country. This looks great! My pet peeve is shirts that come out of the dryer perfect except the collar and the placket is all crinkled. Does it hot enough to smooth the front of the shirt? @Lynne Collar Perfect will be a perfect fit for you. Collar Perfect heat is selectable for the garment you are using and heats up more than enough for the collars and plackets. The design allows a quick swipe to smooth the placket and is designed to combat those pesky shirt collars. There are 5 adjustable temperature settings: Perfect for any temperature (Poly, Silk, Wool, Cotton, Denim, and Linen). 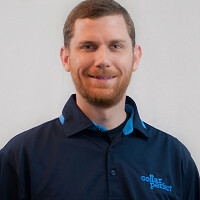 Collar Perfect heats to the same temperatures a traditional iron would for these. Love the concept of this product. My husband's pet peeve is a collar that is not crisp. I was just going to order one and saw that it is already backordered. Any ideas on when it will be available to ship? Hi Chris, they will start shipping a week from tomorrow.